The FLM XP is equipped with a scanning head and programmable z-axis. 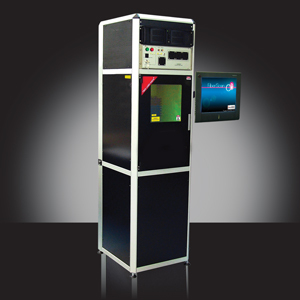 This is a standalone version of the Compact Fiber Laser Marking System. Operating as a standalone unit or as part of an in-line assembly line system, the FLM XP incorporates a Fiber Laser with Scan Head, Industrial PC Controller, Power Supply, Fiberscan C3 Marking Software and a laser safety enclosure. The FLM Series Equipment is safe, compact, and service-free, designed to meet individual marking needs with the ability to mark a wide variety of materials including Direct Part Marking (DPM) of alphanumeric, logos, serial numbers, part numbers, lot and date codes, schematics, graphics, deep engraving and more. The FLM XP is powered by 110VAC outlet, and with its plug-and-play capabilities, it is now easier than ever to setup and begin producing high quality marks on production parts. A 5 year fiber laser warranty and a 1 year system parts warranty is provided.